Perfect lino-cut print for next to the coat rack by James Brown, as found on The Beat That My Heart Skipped. Amazing tea towels from ToDryFor, as seen in Oh Comely! Amazing stickers by Hu2 to help you remember to switch off your lights, as seen on Apartment Therapy. 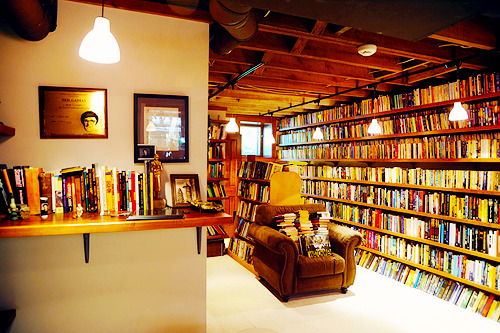 The most incredible website ever for a booklover… A photo blog collection of all the best bookshelf photos from around the world for people who *heart* bookshelves. At a recent meeting in the Arches, I was admiring the work of Jenny Soep on their walls…. fantastic pieces of art based on live music events. She had some stunning pieces hanging, and when I have some disposable income again I plan to add some of her work to my collection. On her website she requested not reposting any of her work, so please do pop over and check it out, as I have honoured her wishes here! Check out her website to see some of her work, and read her blog here. oh comely is a magazine about people and their quirks and their creativity, rather than money and what it can buy. It’s nice to see you here. It’s a magazine that inspires people to be creative, talk to their neighbours and explore new things, rather than buy stuff or lose weight. Imagine sitting down with a cup of tea and a creative friend to hear all the strange things she says, all the curious stuff she does, and about the things she loves.